2018 Topps 35th Anniversary Zack Granite AUTO. ]Players : Trout / Posey. Hi Dale. Could use the ones in the edited post above from your list. 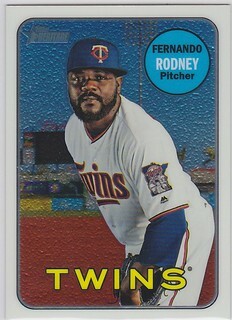 Main collecting interests: Topps sets, Johan Santana (Twins only), and MN sports teams. No problem. Thanks for checking. Collecting Mark Mulder ... looking for anything I don't have. In Memory of Our friend and Bench moderator Randy Martin Aka fatboycards 1963 to 2011. Yes if still available. Haven't signed on in awhile. Originally Posted by David K.
Same thing. I can use it if still available. Limiting my trading for now. Posted & thanks for your patience. Could use 1 copy of each of these Rosario cards. LMK if you find anything off my trade list or a dlvd. price. Thanks.